Packing: Disposable cylinder 14.3lb/6.5kg; Recyclable cylinder 100L, 926L; ISO-Tank. Packing Disposable cylinder 14.3lb/6.5kg; Recyclable cylinder 100L, 926L; ISO-Tank. Application: Refrigerant, can replace R12. 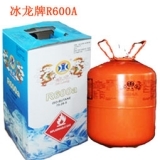 Uses: Refrigerant, can replace R12.